Last weekend Parris and I drove up to Denver to attend the memorial service for our friend Ed Bryant, who died in February. It was a long drive and a sad occasion, but I'm glad we went. It's still hard to believe that Ed is gone. 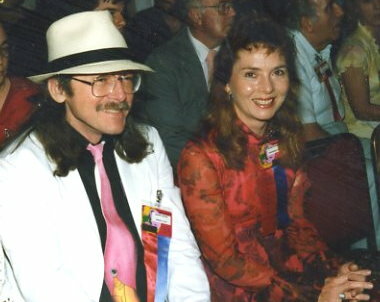 The last time I saw him was in November, in Tucson, when he was toastmaster and I was guest of honor at Tuscon. The first time... that must have been '73 or '74, as best as I can recall, at Harlan Ellison's house in Sherman Oaks. A lot of years, a lot of cons. 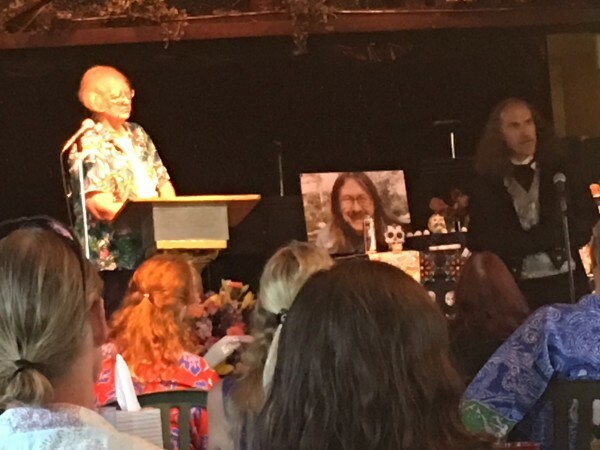 Connie Willis emceed the event, eliciting both laughter and tears from the large crowd that had gathered to say farewell, most of them in Hawaiian shirts and baseball caps. Many others rose to speak as well, including me. Ed left a lot of friends. Ed was a talented writer and a great workshopper, who mentored and encouraged many writers younger than himself and helped them on their way. He was one of my Wild Cards authors, creator of Sewer Jack and Wyungare. But most of all he was a sweet, kind man, with a warm smile and a gentle wit. Science fiction and fantasy will be poorer without him. Memorials like this are not for the deceased so much as they are for those left behind, I believe. It was good to get together with so many others who cared about Ed, and to share our memories of him, with laughter and love. Very fantastic and well written post.Its extremely good and very helpful for me.Thanks for sharing. I never did get to meet Ed, but I thought highly of him from our limited dealings. I was very sorry to hear of his passing. I'm glad you and his other friends were able to memorialize him in grand fashion. My Dad's funeral was on 1 June. I worked on the script with the Humanist speaker, and we used some of his favourite songs and readings. Everyone had a great time, as it should be. I just lost my best friend suddenly and unexpectedly, he was only 39 . Reading and escaping from real life is my comfort zone at the moment . Sorry for yours and your friends loss George . Hope the memorial service gave you some small comfort in celebrating his life . I'm glad to have known Ed. A wonderful person. Wow just seeing this. A friend of mine, a far better writer than I could ever hope to be, met Ed Bryant before and spoke insanely highly of him and has been pushing me to read some of his material. Sorry to hear of his passing and I hope many others join me in checking out his work in the years to come. How sad to hear that Ed Bryant has died. I met him at a writers workshop in the mid 90s, and he was very kind to us students then.